The longest away journey of the season, saw the Hillians claim a massive three points, against, financially troubled, Lowestoft Town FC. Ian Chapman made one change to the side who lost 3-1 to Dorking Wanderers on Tuesday night, with Lucas Rodrigues replacing Aaron Smith-Joseph. The Hillians set up in a 3-5-2, with Pat Harding and Connor Tighe leading the line. The Hillians instantly pilled the pressure on the home side, as keeper Elvijs Putnins saved well from a Rodrigues shot. As the clock struck 20 minutes, the Hillians took a much deserved lead, as Tighe’s dangerous delivery was diverted in by Lowestoft’s Cole. The Hillians goal remained untroubled, with the impressive back three holding firm. The second half began just as the first had finished, the Hillians continued to dominate possession, with Diallo playing a pivotal role in front of the back three. James Shaw remained relatively redundant, with the exception of a couple of crosses. In the 62nd minuted, another threatening Tighe delivery found Fisk, who’s glancing header nestled into the bottom corner – sending the travelling away fans into delirium! With 10 minutes remaining, Smith-Joseph was introduced for veteran striker, Pat Harding, who had worked tirelessly all game. It was Smith-Joseph who gave the home side a glimmer of hope, as he brought down Manu Machaya inside the box in the 90th minutes. Travis Cole converted the spot kick, however it was too little, too late for the home side. The referee’s final whistle was greeted with a huge roar from the travelling fans, who had just witnessed their Hillians side pick up just their 3rd win on the road. Their support was applauded by all players and staff, especially Pat Harding, who ‘let his hair down’…starting a chant or two on the travelling drum! The win sees the Hillians move within three points of Tooting & Mitcham, still with three games in hand over the South London outfit. 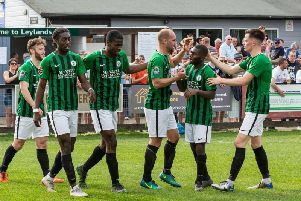 Burgess Hill Town face Merstham tomorrow night.